Why doesn’t that remark cut it anymore? More often than not, it’s symptomatic of an organization that isn’t adaptive. One that hasn’t taken advantage of new technologies, or empowered (or trained, or created policies around) the tools and technologies available to their employees. Tools their employees are very likely already versed in and using in their personal lives. The adaptive organization is one of the themes I’m working on this year as a research analyst. Its ramifications directly target corporate leadership: CEOs, COOs, etc. Next in line is the marketing organization (and who hasn’t heard the refrain that today’s CMO may well be tomorrow’s CTO?). Incentives to work cooperatively are often minimal at best within organizations. Small wonder brands have difficulties getting external agencies, vendors and marketing service providers to work in concert. These constituencies have business and revenue models even less conducive to opening kimonos than do internal staff. 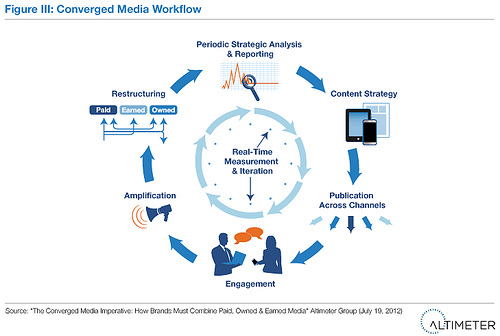 Having just done a deep dive on how paid, earned and owned media are converging (The Converged Media Imperative), it’s become abundantly clear that organizations need to adapt – now – to flow learnings, functions, processes, creative and analytics across all three media channels while eliminating redundancies. Moreover, it’s increasingly necessary to do so with extremely agility; ideally, in real time or something very close to it. Flowing paid, earned and owned media together is a team effort. Each channel is, on its own, highly specialized. Yet commingling these channels not only results in demonstrably better results for digital marketing initiatives. Converged media is also rapidly flowing out into the “real world” of traditional media as well as offline inevitably becomes more digital. Already we’re seeing examples of converged paid, owned and earned media occur on digital billboards and on television. Some forward-thinking marketers are already erasing hierarchies between media types. Just weeks ago, Intel’s Nancy Bhagat blended the company’s global and social media teams into a single marketing strategy operation. So real, or so difficult for enterprise organizations. Take content marketing, for example – or ‘owned’ media. Content is absolutely essential and central to paid, owned and earned initiatives. 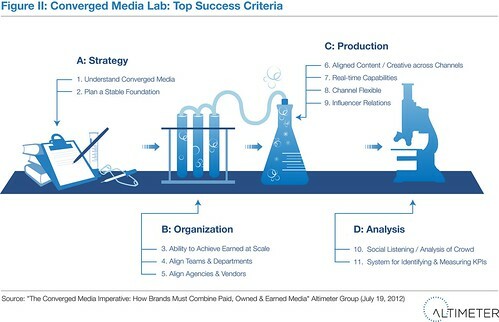 Without solid content, brands cannot achieve earned media at scale. Earned media amplifies messaging, builds word of mouth and buzz, spreads awareness, and with increasing frequency surfaces those ideas that become the core of creative advertising strategy. Yet most organizations have yet to develop a plan or an organizational model to create, disseminate, publish, share and govern content. There’s general awareness that content strategy and marketing reside in the marketing org chart, but where? Just today, I spoke with an organization trying to unknot who is creating content where in the enterprise. Are efforts being reduplicated? Resources shared? Best practices and guidelines adhered to? Their best detective efforts have thus far surfaced over 25 individuals in six distinct divisions who “do” content. It’s assumed very few of these people have met in person, much less collaborated. It’s assumed each group uses its own ad hoc software solutions for managing creation, workflow, resources, etc. Clearly, findings and insights are shared between these disparate content creators, much less their colleagues across the marketing organization. Real time insights and optimization, and shared learnings that inform other initiatives (not to mention that can inform their own work) are an impossibility in vertically organized, hierarchical organizations. Enterprises must be able to move as quickly as their customers do. This requires bold realignment as well as informed empowerment. Advertising and in media are experiencing a moment of convergence. The lines are blurring between paid, earned and owned media. Each is bleeding into the other, blurring the lines between where advertising, marketing and consumer-generated media begin…and end. Facebook: Among their new ad units are pieces of content (owned media) from brand pages that can be converted into an ad unit. “Anything you can do on your page,” Facebook promises brand advertisers, “you can do in an ad.” Earned gets rolled into the equation as these ads are displayed to friends-of-fans, along with Likes and other forms of CGM. Bazaarvoice: The company that built its reputation on powering ratings and reviews has moved these forms of owned media into both paid and owned media. Take their new ad units that display user review in standard display formats. Reviews can be targeted on a number of demographic and behavioral factors, e.g. gender, geo-location, or products viewed. Microsoft: dotJWT created a campaign aimed at the IT community by monitoring conversations in an online discussion network. Comments that were particularly favorable or trenchant were pulled from the private community and plunked into display units. “Geeks don’t respond to advertising, they respond to other geeks,” dotJWT head Jon Baker told me. This examples are just the tip of a very large iceberg. Paid can take a reverse course and morph into owned. And earned. Or both. Consider the long lives of advertising spokes-characters on the web: The Old Spice Guy. The Most Interesting Man in the World. Seinfeld & Superman. This list seems endless. So, with the publication of a research report on content marketing behind me, it’s time to take notes, amass material and look into another area of digital disruption: the convergence and confluence of paid, earned and owned. I’ll be working on this project with my colleague Jeremiah Owyang. Stay tuned for more on the topic as our research theme takes shape and the process begins. Another year, another stream of predictions. Not that predictions aren't interesting, mind you, but I've never been one to focus on them. Sure, I avidly follow trends in digital marketing and media, but what really jazzes me about following the sector for a living is the surprise factor. It's not knowing what comes next because next can be so out-of-left-field disruptive. The other cool thing about this job is it's like being permanently enrolled in grad school. That may not be everyone's cup of tea, but I happen to love constantly watching and learning. So rather than share predictions for 2012, it seems more grounded and sensible to share a list of the top things I plan to study more closely and learn more about in 2012. Perhaps one or two of these topics will turn into a formal research report, perhaps not (oh, to be able to deep-dive into everything!). Behavioral Targeting: Not to begin on a negative, but I'm becoming increasingly convinced BT plain doesn't work. That's why I'd like to examine it more closely. Having done all my holiday shopping online, as well as extensive research and buying for a home remodeling project, it's appalling how many wasted BT ads I see, most for the selfsame products I actually bought from the advertiser. "This can't be right," says my consumer persona to my analyst persona. "Look more closely at the methodology of all those studies out there that 'prove' BT's effectiveness." Personalized Search This has been going on a while now, of course, but more and more, your search results differ significantly from my search results. Location, time of day, social graphs, search history -- a zillion factors figure in to what search results are displayed, and as a result, what ads and data appear in your browser. Need to keep up with this continually moving target. Social Media Fatigue Facebook, Twitter, Google +, Foursquare, Pinterest, LinkedIn, Miso - and that's just a few off the top of my head. Just as consumers never watched all of the 200 or so cable channels bundled into their subscription packages, there's only so many hours in the day to update where you are, what you're doing, what you're watching and eating and with whom. This space seems primed to shake out, doesn't it? How will consumer behavior and adoption change, and how fast can new social plays keep launching? Big Data Collecting, crunching and making actionable data from disparate on- and offline sources will require significant investments in technology, manpower and learning for companies. Big data is all the buzz, yet many marketers still don't know precisely what it is. Everyone needs to bone up on this topic in 2012. Real-Time Marketing Top consumer brands, notably Pepsi, are starting to take this topic very seriously, and even some B2B giants such as GE are looking at the space. Monitoring, assessing, triaging, assigning, and responding to real-time conversations, events, posts, tweets and other digital information increasingly matters. And like Big Data, the challenges and resources it requires are formidable. A fascinating area to keep an eye on. Regulated Industries It's fascinating to watch highly regulated industries, such as pharma and banking, attempt to embrace digital marketing in general, and social media in particular. They face formidable barriers and more interesting challenges than most. I'm hoping to speak with more marketers from regulated sectors to learn more about how they're coping. Internet of Things When everything has an IP address, everything gets a lot more interesting. Once devices from cars to refrigerators and the dog's food bowl are connected, the implications for marketing, communication and even society will take surprises turns. This space is quite simply mesmerizing. Effects of Social Movements Occupy Wall Street fallout, the presidential election in the US, societal shifts in the Middle East. Social change resonates in digital channels (and vice versa). It's going to be a big year for social change, and that will inevitably impact digital. What's Starting Up? As always, I'll be keeping a close eye on start-ups. What's launching trend-wise? Who's getting funded? Who isn't? Following the money and the technology is not optional - it's integral to watching this space. Content Marketing A pet topic, the subject of my most recent book and my forthcoming research report. Keeping a close eye on how marketers are moving into content, which requires a rebalance of thought processes (ongoing, not episodic, campaign-based thinking), as well as new budgets, agency relationship and staffing requirements - not to mention a shift in corporate culture. That's my 2012 syllabus. What's yours? Please reply in the comments. And if you're behind a company active in one of the above areas, perhaps we should arrange a briefing sometime this year. One essential difference between content marketing and episodic, campaign based advertising is the former is a continuum. It has a beginning and a middle, but the end should ideally recede somewhere over the horizon. It’s therefore essential to plan for continuity in content marketing. Without a story, characters, a theme or a hook that has legs over time, the well will run dry awfully fast and marketers will find themselves staring at the proverbial blank page, puzzling over how to fill it. What strategies and tactics can marketers adopt to ensure longevity? There are several, and they fall into fairly neat categories. The following is by no means a comprehensive list, but instead aimed a getting you thinking about the themes that make content sustainable. 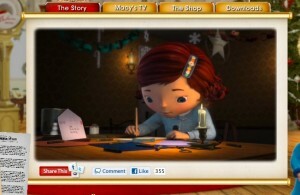 Virginia (pictured above) appears in animations on the store’s website, as an augmented reality character in certain points of the store itself, and even stars in an animated television special. There are supporting characters in her story, and licensing agreements are underway for a line of dolls and toys. Yes, Virginia, characters can be a content marketing tent pole. Curation: Just as Virginia existed in real-life, so does a lot of useful content in the wild. 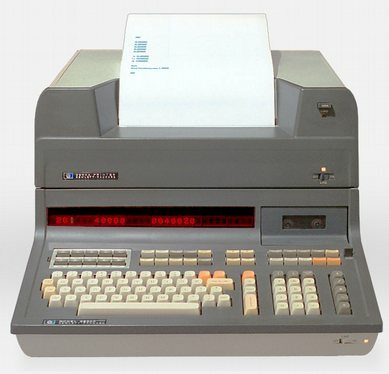 No matter your product, service or industry, there’s lenty of content about it out there already, and likely more every day: news, trade publications, conferences, blogs, online videos, interviews and much more – more than your target audience is likely willing to wade through without guidance. That’s where content curation comes in. Rather than reinvent the wheel, curation is a continual approach to judiciously finding and presenting relevant, topical and current content on a given topic, industry or area. It’s a common tactic. Nearly half of marketing executives (48%) are using content curation according to a 2011 survey from HiveFire. People inherently rely on trusted sources: friends, family, brands, companies, experts, you-name-it, to help keep them informed, educated and even amused. Just as you probably have one go-to friend for car advice, another who can tell you what new books or films are worth seeing, or another who’s got the lowdown on the latest places to eat, business are collecting, organizing and filtering content around their own fields of expertise. Community: Build it and they will come – and create content for you. OK, maybe it’s not that simple, but plenty of companies have benefited tremendously from creating communities in which consumers can gather to discuss given topics. This holds particularly true in the tech sector, where brands such as Apple, Microsoft, IBM and any number of major electronics manufacturers run forums in which members can discuss business problems and product issues, offering one another help and support. The benefits go far beyond ongoing content creation. By listening and participating in discussions, the sponsoring brand has an early-warning system regarding problems, issues and often, competition in the field. Monitoring discussions can lead to advances in product development, and customer service expenditures can be dramatically reduced when customers are empowered to help one another. Rubrics: News isn’t predictable, but newspapers are (magazines, too). Pick a periodical, any periodical, and you’ll find a wealth of regularly scheduled features and columns: the editorial page, a daily horoscope, or a weekend “What’s On” section. Wednesdays may be devoted to cooking and recipes, Thursdays to cars, or home design, or science. These regular features anchor the publication. They give readers something to look forward to (and return to). Content marketing can work on the same principle. Develop regular, repeatable content units: an events calendar, expert opinion columns, how-tos, a video of the week. Make it original, repeatable, and schedule it to appear regularly. Rather than re-invent the wheel, these editorial calendar foundations drive their own momentum while providing the audience with both new material and a reassuring sense of familiarity. The above is only the beginning of ways you can play content forward. 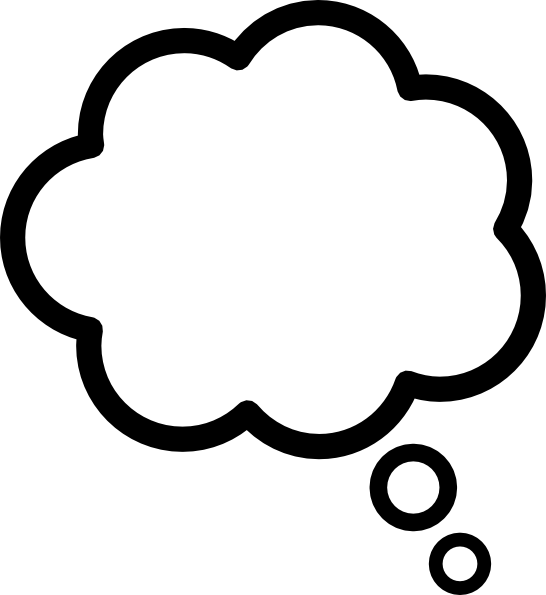 We haven’t even begun to discuss user-generated content (hey, why should you do all the work! ), or ongoing initiatives in how-to, utility or educational content. But by now, you should get the idea: sustainability. It sure beats looking at a blank page and wondering how to fill it, day in and day out. Read more about Is There a Digital 180 Degree Law?